Summary: Padma Venkatraman’s inspiring story of a young girl’s struggle to regain her passion and find a new peace is told lyrically through verse that captures the beauty and mystery of India and the ancient Bharatanatyam dance form. This is a stunning novel about spiritual awakening, the power of art, and above all, the courage and resilience of the human spirit. Review: From the very first scene of the book, it is obvious that dance is not just something that Veda does, it is her passion. When she dances, she is fully alive and she feels beautiful. Her accident threatens to bring all of her dreams crashing down, but Veda finds the determination to start again. She has a doctor and family that believes in her and it helps that she is stubborn too. Not long ago, I saw a comment on Twitter about how not many young adult novels deal with religion. In A Time to Dance, religion and spirituality play a very big role. By the second page, the connection between God and dance has been made. Veda and her family visit a temple with sculptures of dancers on the walls. When she climbs up to see them, a priest explains, “You don’t have to climb ladders to reach God. He dances within all He creates.” In the aftermath of her accident and other issues she faces throughout the book, Veda questions her belief though. She questions the value of prayer and wonders what God is. Veda has a physical journey as she relearns how to walk and dance, but she also has a spiritual journey as she begins to see dance as more than just a skill to learn. As she had been competing and performing, she was working for the applause and awards, but she begins to learn that there is more to dance than she had imagined. I really appreciated the family relationships in the story. Her grandmother is very influential in her life. She models a spiritual life and she nurtures Veda daily with snacks, massages, hugs, listening and much more. Their relationship is beautiful. Her grandmother is also the person who suggests a new dance teacher for Veda – one who is focused on the emotional expression and devotion in dance and not on competition. This new school brings Veda much to think about and also happens to contain a young man who catches her eye. 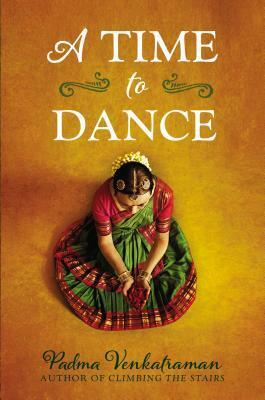 While reading A Time to Dance, I became curious about Bharatanatyam dance. There are many videos on YouTube and it was wonderful to see what it looked like. If you are unfamiliar with this dance form, I highly recommend seeking out some of the videos. Learning about this particular type of dance was fascinating. It was also intriguing to learn more about Shiva especially since I had just spent time in the Indian section of the Art Institute of Chicago last weekend and saw a great sculpture of Shiva as Lord of the Dance. Recommendation: Get this one soon. The story is rich and inspiring. Veda’s journey is one you won’t want to miss. I’m so glad you liked this book as much as I did. I love reading verse and it’s a book you can re-read again. It’s one of my 10 diverse lit summer reads that I posted on my blog last month.